Norton Password Manager lets you add a new login or change the title, URL, user name, and password for the logins that you have saved in the Logins window. The updated information is automatically filled the next time you visit that webpage. You can use the arrow available next to the URL to quickly launch a login webpage. In the Norton Password Manager window, click + and select New Login from the drop-down list. In the Create Login window, enter the required details and click Save. 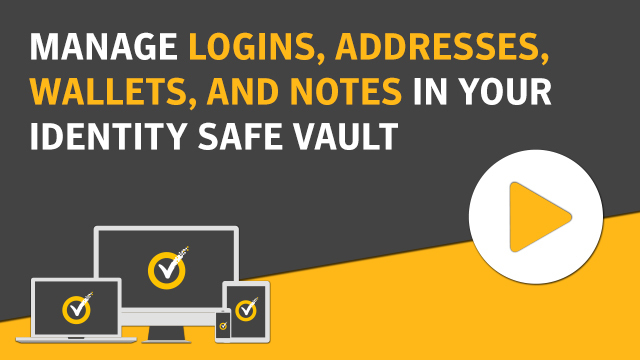 If you select the Require vault password, you will receive a prompt to enter the password of Norton Password Manager before it autofills any login. To edit a login, click the icon and click Edit to edit the login details. In the window that appears, make the required changes and click Save. To delete a login, click the icon and click Delete to delete the login details. In the Are you sure? window, click Delete Item. Click the drop-down menu at the top of the window and choose New Login. In the CREATE LOGIN window, in the Title box, type a name for the login. In the Tags box, type the category of the login. In the Login URL box, type the URL of the website. Ensure that you prefix the URL with HTTP or HTTPS. In the Username dialog box, type the user name of the login. In the Password box, type the password of your login. Prompts for the password of Password Manager before it autofills any login. You should select this option to make your login credentials more secure. For example, you can use this option for your online banking website. Automatically fills your login for the website when you visit. Symantec recommends that you select this option to fill the login information for the webpage. Automatically logs you in to the website. In the left pane, click Logins. Click the login that you want to edit. You can use Sort by option available at the top of the Logins pane to locate a login faster. You can also directly search for a login in the Search your vault box. In the window that appears, click Edit and do the required changes. Click the login that you want to delete. In the window that appears, click Delete. In the warning dialog box, click Yes. Log on to Norton Password Manager app. In the vault screen, tap Logins. Tap the plus icon available at the top of the screen. In the Create New Login section, enter the required details. You can add a login to your Favorites and add a note for it. You can also choose a background color for your logins. Tap the login you want to edit or delete. You can also search for a login in the search box. To edit a login, tap the edit icon available at the top right corner of the screen, do the required changes, and then tap the tick icon. To delete a login, tap Delete this Login at the bottom right corner of the screen and confirm deletion in the warning dialog. Based on your setting, you may be asked a vault password to complete the deletion.